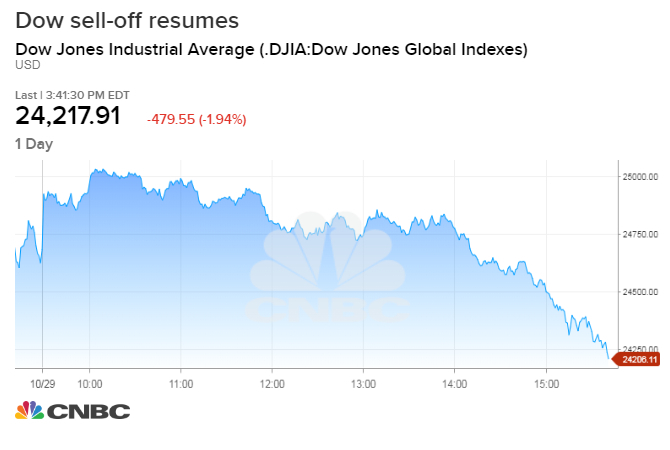 Stocks closed lower on Monday, giving up sharp gains from earlier in the day in a wild session that saw the Dow Jones Industrial Average travel more than 900 points. The S&P 500 closed in correction territory, down 10 percent from its recent high. Traders blamed the possibility of more U.S.-China tariffs coupled with a drop in tech shares for the decline. The Dow fell 245.39 points to 24,442.92, erasing a 352-point gain, as Boeing dropped 6.6 percent. At the lows of the day, the Dow was down 566 points before coming back shortly before the close. The 30-stock index also briefly dipped into correction territory. The S&P 500 closed 0.7 percent lower at 2,641.25 after gaining more than 1 percent earlier in the day. The benchmark is now down 10.2 percent from its high reached at the end of September. The Nasdaq Composite fell 1.6 percent to 7,050.29 as shares of Amazon got pounded. "I think this is an old-fashion tech wreck," said Mike Bailey, director of research at FBB Capital Partners. "Investors are reassessing growth prospects for next year." Bloomberg News reported that the U.S. is planning on slapping tariffs on more Chinese products if upcoming talks between President Donald Trump and Chinese President Xi Jinping falter. Both countries have already implemented levies on billions of dollars worth of each other's goods. Amazon and Netflix rolled over throughout the day, capping the stock market's gains; the stocks were down 6.3 percent and 5 percent, respectively. These losses offset strong gains from bank shares. J.P Morgan Chase and Wells Fargo both climbed more than 1 percent, while Goldman Sachs gained 1 percent. The SPDR S&P Bank ETF (KBE) surged 1.8 percent. Monday's moves come after a 3 percent drop on the Dow last week, which was capped off by a decline of nearly 300 points on Friday. The S&P 500 and Nasdaq dropped 3.9 percent and 3.8 percent, respectively. Worries over a possible slowdown in corporate earnings growth, as well as in the global economy, have sent the major indexes down sharply this month. 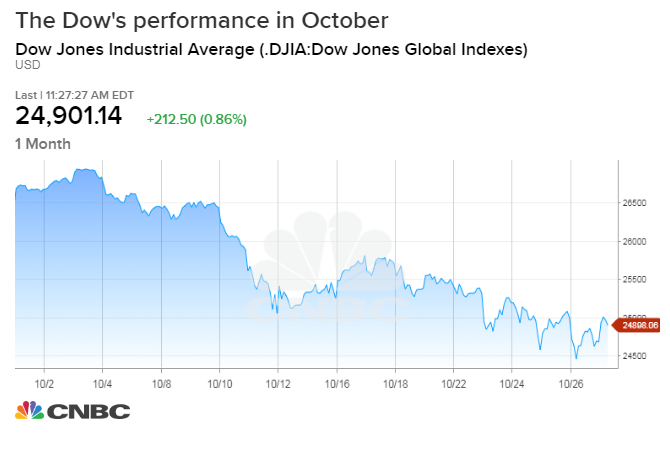 The Dow and S&P 500 are down 7.7 percent and 9.4 percent, respectively, for October. The Nasdaq, meanwhile, has lost 12 percent. "It's likely we see some lows get retested once again, once again we can't assume a v-bounce as many were calling for back in early October," said Andrew Thrasher, portfolio manager for The Financial Enhancement Group and founder of Thrasher Analytics, said in a note. "Typically, v-bottoms show themselves when the market declines on news, as in a single event that rocks the market but that wasn't the case this time," Thrasher said. "Instead we saw a slow bleed in market participation that finally broke the dam of selling and sent stocks across the board lower." The S&P 500's decline this month has shaved off $2.141 trillion in market cap, according to data from Howard Silverblatt of S&P Dow Jones Indices. Silverblatt's data also show Amazon, Microsoft, Nvidia, Facebook and Apple are among the biggest contributors to the decline this month. Facebook and Apple will both report financial results later this week. "The market will not reward earnings unless you've got growth in the top line, bottom line and guidance. It can be brutal for companies that don't hit all those marks," said Quincy Krosby, chief market strategist at Prudential Financial. "There are questions remaining on whether this market can really regain strength if tech doesn't lead." U.S. stocks got a boost earlier on Monday after IBM agreed to buy Red Hat, an open-source software distributor, for around $34 billion. Red Hat shares surged 45.4 percent on the deal, while IBM's stock fell more than 4 percent. "While it will take some time to see the merits of this deal manifest and the impact on enterprise hybrid cloud competitive deployments in the field … we believe the combination of Red Hat and its Linux cloud platform with IBM could represent a formidable cloud behemoth for the coming years," said Dan Ives, an analyst at Wedbush Securities, in a note to clients.